Simple, safe and ultra portable with optional South East Asian maps and 16GB memory for more multimedia fun, carNAVi Eco300 is your leightweight personal travel assistant for life on the go. carNAVi leads your way with voice guided turn-by-turn directions to get you there on time and keep you safe on the road. 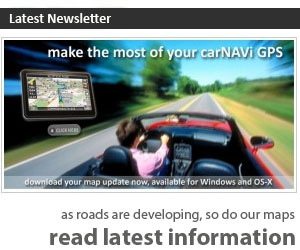 Preloaded with a detailed roadmap covering the whole Philippines including many thousands of points of interest (POI), preinstalled detailed maps of Malaysia and Singapore and a worldwide map of major roads and highways, it’s compact, versatile and easy to use. Additional maps* of SE Asia are available free of charge. 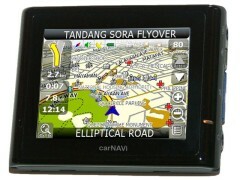 Simply touch the state of the art flat-touch-panel colour screen, key in your destination and your carNAVi takes you there with turn-by-turn spoken directions in English or Filipino, 2-D or 3-D map view with elevated flyover, tunnels and smooth map updates. A database of Points of Interest for shopping, restaurants, public buildings, gasoline stations and much more make it easy to find destinations in unknown areas. Beside the fantastic navigation features the carNAVi unit has a build in MP3– and Video-Player, you can hear your favourite songs or watch Mpeg/AVI videos stored on the SD memory card either with the build in speaker or simply connect it to your car audio system. The carNAVi comes with a Photo Viewer and Ebook reader. carNAVi has a unique sleek, slim design with a flat touch panel to fit comfortably in your pocket. Its rechargeable lithium-polymer battery makes it convenient for navigation by car or on foot with up to 4 hours’ usage between charges. The USB mass storage device is compatible with Windows® 2000 or later.